Mapoon, a small village and a former Aboriginal reserve, is on the west coast of Cape York Peninsula, near the entrance to Port Musgrave. It is 75 km north of Weipa and 170 km south-west of the tip of the peninsula. In 1899 it was estimated that the mission had 400 inhabitants. By 1908, when Mapoon had been designated an Industrial School (for taking children forcibly removed from their families), the reserve included an extensive area from north of Mapoon to south of the Archer River (Aurukun). There were an estimated 1500 Aborigines on the reserve. In addition to fruit and vegetable crops, a cattle herd was kept and numbered 500 head in the 1930s. Soon after World War II a geological investigation confirmed the presence of good quality bauxite deposits. Large prospecting leases were taken out and in 1957 an Act of the Queensland Parliament assigned 5780 sq km of Reserve land on medium and long term (100 year) leases to Comalco. An Alcan mining lease assigned 1388 sq km in 1965. The mission closed in 1962 in anticipation of the removal of the Mapoon population to enable mining to proceed. The community resisted, and evictions and building demolition followed in 1963. 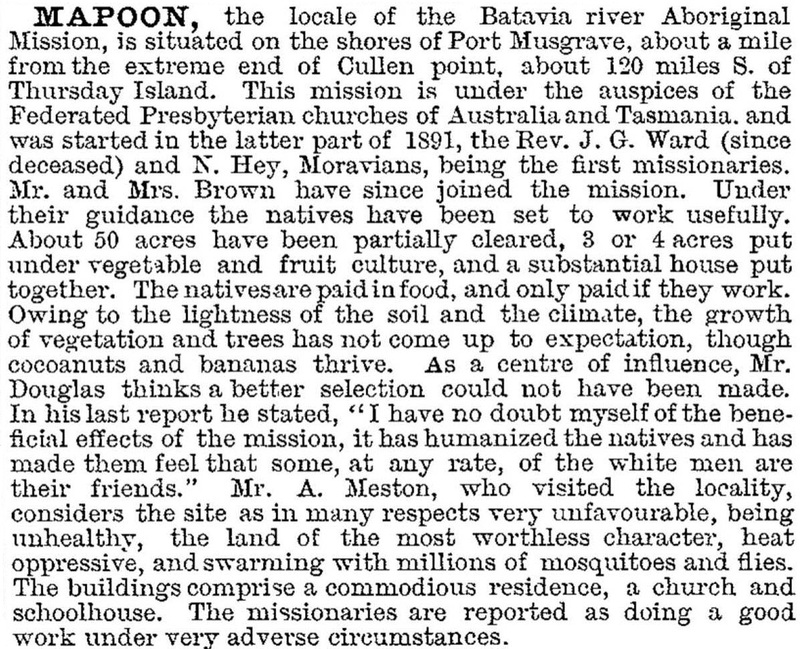 Some inhabitants went to New Mapoon, near Bamaga at the top of Cape York, and the last of those evicted were sent to Weipa. In 1974 several former Mapoon families returned to Old Mapoon, aided by a Commonwealth grant. The settlement was officially returned to the Aboriginal people in 1989. In 2002 the Mapoon Aboriginal Council was created, administering an area of 530 sq km.